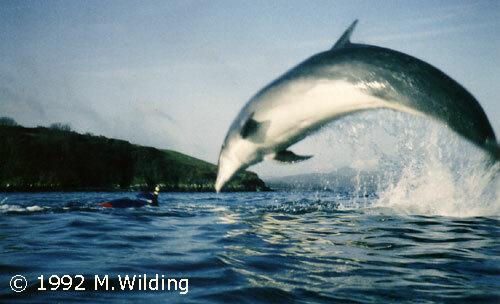 A water-level view of the acrobatic dolphin in action. The snorkeler is 'Tex' (Rachel Sharpe). Typically the dolphin is going for maximum effect by aiming his re-entry point within inches of her right shoulder, probably before she has even had time to look up since he exploded into the air!